I am not a fan of reality TV. I know that may put me in the minority of television viewers as there are literally hundreds of shows dominating the small screen: cooking contests, modeling contests, designer contests, housewives in every state, multiple bachelors and bachelorettes or couples in crisis, tattoo parlors, this celebrity family, that celebrity family, people buying or remodeling houses, hunting antiques, getting help with addictions, and on and on it goes. Clearly, there must be an audience for this type of show or they wouldn’t keep making them, right? Ironically, these shows are called “reality”, when in truth they are just as staged as anything else. They are an editor’s medium, a producer’s medium, with situations carefully manipulated to ignite a spark of drama that might make good television, and if it doesn’t they can just edit clips together to fabricate it. Ratings and seasons numbering in the double digits are the end goal at any cost. So this has got me thinking, what is the appeal of this kind of entertainment? Perhaps reality TV offers us an escape into the lives of people we somehow consider more worthy of our attention (richer/more famous/more talented/more entertaining/more more more…). We delight in their dramas because we are oddly comforted that they have the same problems that we do, or at least that they also have problems even if they are bizarre ones. Reality TV is all spectacle and drama, dazzle and glitz. Rarely do we learn anything about ourselves. Rarely are we challenged to think in new ways. Rarely are we challenged at all. We allow these shows to distract us from our lives and our problems, and we let their subjects’ petty problems become important to us, but we don’t truly see ourselves in the people on the screen. The great playwright Noёl Coward wrote the bulk of his plays and music in the decades containing two world wars, the Great Depression, and a myriad of social and economic changes. While his plays could be taken at surface value as light-hearted fluff and pure entertainment, such a view of his work does him a great disservice. At the time he was writing them, these plays offered his audiences an escape into a world of martinis and grand pianos and gowns, a peek at the “lifestyles of the rich and famous.” Given the war-torn, devastating, unemployed lives they were living outside of the theater, I’m sure this escape was a welcome one. I often hear people talk about theater as an escape, and sure, we all need a break sometimes where we can be purely entertained for a few hours. But it shouldn’t always be an escape. Sometimes, even the lighter fare is an opportunity to peek into someone else’s life and be changed by it in some way. Noёl Coward once said, “If by any chance a playwright wishes to express a political opinion or a moral opinion or a philosophy, he must be a good enough craftsman to do it with so much spice of entertainment in it that the public get the message without being aware of it.” Our final production in the Cloverdale Playhouse’s 2018 season is Coward’s brilliant comedy Private Lives. Even the title hints that there may be more going on in the story than what we see on the surface. The characters are glamorous and wealthy. They honeymoon in France and flit off to their Parisian flats. They play grand pianos and lounge with the finest brandy in hand with very little care for the realities of their situations. And they are wickedly funny! They subtly (and sometimes not so subtly) snip and sneer at each other or those around them with a cleverness and wit that only the great Noёl Coward can craft, and we can’t help but laugh. Thankfully, their gibes aren’t directed at us. We are outsiders, spectators in their shimmering world, so we can revel in their drama. Perhaps these types of plays are a bit more similar to reality TV than we realize. Or perhaps Noёl Coward had a secret mission to show us these people living grand lives, see their deeper, private unhappiness, and learn from it. Yes, we can escape our troubles and laugh at the foolishness and impetuosity of characters who act without regard for consequences. In fact, they seemingly suffer no consequences. Yet that isn’t real life. In the real world, people get hurt, make mistakes, and fall on troubled times. Coward reminds us to open our eyes to the real world around us, not to live our lives the way his characters do. By creating people with limited compassion or empathy, he guides us to remember the value in conscience and honor and care for others. Hopefully, we laugh ourselves into stitches throughout the play, but also leave paying more attention to the world around us rather than hiding from it. When times are hard, when our world seems bleak, perhaps it is okay for theater to be an escape. Eventually, though, we have to walk back outside and face our realities, hopefully a bit changed by the time we were away. 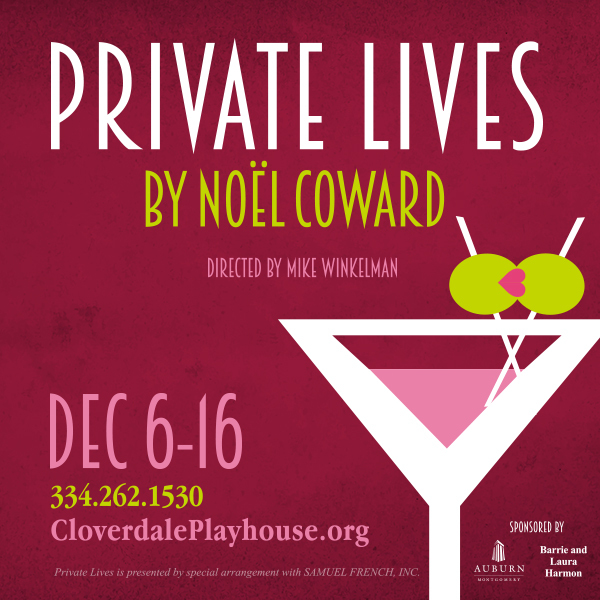 Private Lives runs December 6-16, Thursdays-Saturdays at 7:30pm and Sundays at 2pm. Visit www.cloverdaleplayhouse.org or call the box office at (334)262-1530 for more information.